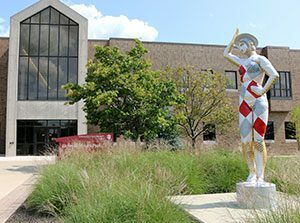 The Outdoor Sculpture Exhibit now has six new sculptures in place throughout the Indiana University East campus. The sculptures are part of a juried exhibit. The jurors for the exhibit are IU East faculty Ann Kim, associate professor of fine arts, Carrie Longley, assistant professor of fine arts, and Ed Thornburg, art director. “Wamazon” by Gary Mitchell is on display outside Hayes Hall. Each piece is on loan and will be on campus for two years, through August 2019. Artists from across the United States were invited to submit their work for consideration to be included in the Outdoor Sculpture Exhibit. There were 66 artists who submitted 114 pieces to be juried for the exhibit. Works for the exhibit are chosen based on having a strong visual presence in the open and natural setting of the campus quad and also have dynamic design from multiple vantage points. Artist John Parker’s piece, “Daddylonglegs,” is located on the hill to the left of Whitewater Hall’s main entrance. Parker is from Glenside, Pennsylvania. He drew on insect forms from nature, the “life-segmented, hard shelled bodies, robotic and armor coated, yet able to instantly take flight.” He adds that the large scale of these otherwise small creatures comes from reality and fantasy of the prehistoric world. Artist Victoria Nieman, from Oak Creek, Wisconsin, said her piece is about trying to find balance after loss. “The Unending Ache” is about the feeling of helplessness, suffering your own mistakes, and being keenly aware of your own lacking, she said in her artist statement. “It’s about the raw edge of a long hurt, and the vulnerability of fear that accompanies all of this,” Nieman said. “Despite the darkness there is profound self discovery through struggle, something that puts us on the path to total understanding if we are brave enough to remain open to it. Real beauty is not on the skin, and it is not of youth. It comes with time and experience, it is in found inside us, in the place where we find our deepest drives, our unrelenting perseverance and the light of our individual will. It leaves marks on our souls that give us our identities and our uniqueness. It is our flaws that define our beauty, not our perfections.